Webinars are a great way to stay up to date on the newest developments. They offer timely information from experts and have the flexibility of being viewed at your convenience without the expense of travel. SSTI's Webinar Library puts SSTI webinars at your fingertips — when you want them. 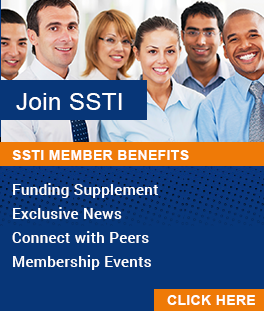 Most SSTI webinars are available for purchase, while some (particularly those related to Regional Innovation Strategies notices of funding availability) are available to the general public. Many episodes from the SSTI Inspiring Thought webinar series are available for purchase individually or as part of a bundle. Prices are just $29 each or $75 bundled for members and $49 each or $95 for non-members. Following your purchase, a link to the recorded presentation including all audio, slides and questions will be sent immediately to your inbox. The presentation is not available for download. The link will be active for 60 days following your purchase. Speakers or headphones and an internet connection are required. Contact Susan Niple (niple@ssti.org | 614-901-1690) with any comments or questions and be sure to check out our Upcoming Webinars and mark your calendar to join us for a future event! Should America invest more in top R&D universities? How are social and political forces changing the context in which universities operate? Join SSTI for a conversation with Jason Owen-Smith, author of Research Universities and the Public Good. We will talk about his book and have a broader conversation about some the outside forces exerting pressure on universities and the impact those forces are having. Available for purchase individually or as part of a bundle. Order now. Rural areas face unique challenges in their economic development efforts. Tune in to this joint webinar between SSTI and the National Association for Community College Entrepreneurship (NACCE) to learn about winning strategies and key elements to consider when creating an innovation network to strengthen your economy. Our panel of experts will share their lessons on developing partnerships and growing innovative collaborations to strengthen communities in rural areas, with a segment on agricultural outreach as well. In 2017, EDA issued a $17 million funding opportunity for the Regional Innovation Strategies program, which supports networks that strengthen the transformation of innovations into new products, businesses and jobs. SSTI and a panel of previous RIS winners discuss their strategies and lessons learned on application development and program implementation. From assessment of worker skill-available position matches, to apprenticeship programs and corporate-identified needs, workforce initiatives throughout the country are increasingly focused on evidence-driven training. In this SSTI Inspiring Thought webinar, a panel of researchers and practitioners discussed recent research and investments related to workforce programs and the outlook for these initiatives in 2017 and beyond. More than a dozen states have programs that provide a matching grant to companies that win a federal award. There are some key differences across states in program structures, and few states report useful impact metrics. On this SSTI Inspiring Thought webinar, John Hardin with the North Carolina Department of Commerce and Lauren Lanahan from University of Oregon discussed what one state has strived to achieve with their program and what research tells us about the opportunity to influence SBIR's effectiveness. Back to School: How is your region teaching entrepreneurship? Universities throughout the country are increasingly interested in providing entrepreneurship education to undergraduate students. There are many forms for these efforts, including degrees and certificates, club activities, and mentorship or other partnerships with regional accelerators and venture development organizations. During this SSTI Inspiring Thoughts webinar, experienced practitioners discussed what it takes to make a student entrepreneurship program successful. In recent years, the Pittsburgh region has gained national attention in its transition from an economy built on steel and heavy manufacturing to one that focuses on innovation, education, healthcare and cutting-edge research and development. As Pittsburgh continues to develop, however, new challenges have occurred, prompting civic leaders to make a concerted effort to view their innovation-led economic growth through a lens for inclusivity. In this Inspiring Thought webinar, hear how Pittsburgh is reinventing its regional economy, developing a roadmap for inclusive innovation, and building capacity to make sure that growth and opportunity occurs throughout the entirety of the region. Institutions of higher education throughout the country are playing a growing role in their regional innovation economies. Rather than operating independently, many institutions are forming partnerships with the private sector and other external stakeholders to achieve greater leverage and impact for their programs, centers and funds. SSTI and the American Association of State Colleges and Universities Grants Resource Center jointly hosted this Inspiring Thought webinar to discuss the practical, legal and financial considerations required to make these models work. Innovative companies in every region are looking to use or develop the latest and greatest tech, research and talent. Federal agencies are working with these companies more frequently and efficiently, whether by facilitating licensing, providing access to unique equipment, or through other efforts. During this Inspiring Thought webinar, a panel of federal officials discussed new initiatives and how organizations throughout the innovation ecosystem can work with the agencies to better support tech-based development. University Pre-Accelerators New Hot Trend, But What Are They? Since 2014, a number of universities across the country have launched pre-accelerator programs to support entrepreneurial growth among faculty and students. The growing popularity has raised several questions among economic development professionals including, “How are they structured?,” “What services do they provide?” and “How do they fit within an innovation ecosystem?.” During this month’s Inspiring Thought webinar, a panel of experts addressed these important questions about pre-accelerators and much more. Enacting a successful tech-based economic development strategy poses unique challenges in rural areas. Yet, with educational attainment rates lower and poverty rates higher than metro areas, there are clear motivations for striving to improve rural prosperity. During this webinar, SSTI hosted a conversation with some of the country’s successful and innovative rural TBED programs. Consumer products are not the only initiatives that can benefit from America’s growing acceptance of crowdfunding – organizations supporting entrepreneurs are also learning how to tap into this trend. Join this month’s Inspiring Thought webinar to hear about some of the successful projects across the industry and to learn the nuts and bolts of the Launch NY experience. The general public is overwhelmingly positive about supporting innovation, but how we talk about relevant policies and programs has real impacts on this support. Whether advocating for new policies or funding, tech-based economic development organizations must communicate their impacts and needs successfully to elected officials and other public stakeholders. This Inspiring Thought webinar discussed a national survey SSTI conducted about innovation policy and provide practical advice for practitioners. The following webinars are available for free to the public. Hosted by SSTI on behalf of the EDA Office of Innovation and Entrepreneurship, this webinar will provide information on the FY 2019 notice of funding opportunity for EDA's Regional Innovation Strategies program -- the i6 challenge and seed fund support awards. Both the recording and slides are available: Register now to access for free. EDA’s Regional Innovation Strategies program — which makes i6 challenge and seed fund support awards — has released its notice of funding opportunity for FY 2018. During this webinar, EDA’s Office of Innovation and Entrepreneurship discusses the program and application process. Thriving regional innovation clusters are not only competitive on a national scale, but also internationally. Clusters and regional innovation initiatives can play an important role in helping to boost international partnerships to advance economic development. In this webinar, Dean Amhaus with The Water Council and Vijay Chauhan and Donn Rubin with Global STL how they are cultivating partnerships on an international scale to increase exports, foreign direct investment, and sector-driven collaboration. SSTI hosted with the Economic Development Administration an informational webinars regarding the 2017 Regional Innovation Strategies (RIS) program. Under the RIS program, Commerce solicited applications for $17 million in funding awards. These awards are intended to help develop regional innovation ecosystems that provide support and funding to startups engaged in the commercialization process that ultimately lead to high-growth companies – the drivers of regional economic prosperity and job creation. Andria Fisanich and Eric Smith with EDA's Office of Innovation and Entrepreneurship presented. To help economic development practitioners bridge gaps in capital access, this SSTI webinar explored ways cluster and innovation initiatives are identifying and addressing unmet capital needs within their industries and regions. Bonny Moellenbrock with Investors Circle and Ron King of BioAccel discussed topics such as unlocking capital in a region, developing and managing investment funds for cluster companies, and collaborating with programs to connect companies with capital providers. Regional innovation economies thrive when a variety of institutions promote entrepreneurship. Community colleges are often recognized for their contributions to workforce development but can be overlooked as supporters for startups and entrepreneurs. This joint webinar between SSTI and NACCE featured Tim Putnam, director, and Daniel Winegarden, director of business acceleration, of Pappajohn Entrepreneurial Center at North Iowa Area Community College and Laura Stein, vice president of Iowa Innovation Corp. discussing Iowa’s approach to regional innovation, which incorporates the state, industry, universities and community colleges as key partners for a thorough approach to entrepreneurial development. Listen to learn about the Hawkeye state and to discuss tools you can apply to your own region or institution. NSF’s I-Corps program has quickly grown to help nearly 1,000 teams of academic faculty, students and entrepreneurs test the commercial potential of university R&D. How prepared are your regional innovation initiatives to exploit the I-Corps opportunity and to integrate successful I-Corps outcomes into your innovation strategy? SSTI and a panel of Jim Aloise and Orin Herskowitz with Columbia Technology Ventures and Columbia University and Lynn Gellerman and Kaith Knutsen at TechGROWTH Ohio at Ohio University held an honest and interactive discussion about the program’s potential, its early impacts and ideas for how best to leverage I-Corps to achieve even greater economic outcomes in your region. Is your organization currently using or interested in pursuing clusters as an economic development tool? To help inform this process, Ifor Ffowcs-Williams, the CEO of Cluster Navigators and a Co-Founder of TCI, joined SSTI for a special webinar drawing on his experiences engaging more than 1,000 clusters in over 50 countries. With a focus on the United States, we explored how both established and aspiring cluster initiatives can use The Cluster Development Handbook and the 12 Steps of Cluster Development, authored by Ffowcs-Williams. Discussion included topics such as cluster identification, developing short- and long-term strategies for success, launching an organization, and measuring and evaluating impact. We also considered how public agencies (especially at the state and local levels) can support cluster development and potential future opportunities for cluster development in the U.S. The U.S. Economic Development Administration’s (EDA) Regional Innovation Strategies program recently announced 35 awardees of the $15 million FY 2016 competition. Did your organization apply? Are you interested in applying for future funding opportunities? Have questions about the selection process or how to prepare an application? Representatives from EDA's Office of Innovation and Entrepreneurship presented an SSTI-hosted webinar discussing the program, recent awards and tips on building a competitive proposal. Craig Buerstatte, Eric Smith and Andria Fisanich with EDA's Office of Innovation and Entrepreneurship presented. SSTI hosted with the Economic Development Administration (EDA) an informational webinar regarding the 2016 Regional Innovation Strategies (RIS) program. Under the RIS program, the U.S. Department of Commerce is soliciting applications for $15 million in funding awards. These awards are intended to help develop regional innovation ecosystems that provide support and funding to startups engaged in the commercialization process that ultimately lead to high-growth companies – the drivers of regional economic prosperity and job creation. Julie Lenzer, Craig Buerstatte, Eric Smith and Andria Fisanich with EDA's Office of Innovation and Entrepreneurship presented. The U.S. Economic Development Administration’s (EDA) Regional Innovation Strategies program recently announced 25 awardees of the $10 million FY 2015 competition. Did your organization apply? Are you interested in applying for the $15 million competition that will occur in FY 2016? Have questions about the selection process or how to prepare a successful application? SSTI was pleased to host representatives from EDA's Office of Innovation and Entrepreneurship for a webinar discussing the program, recent awards and tips on building a competitive proposal. Julie Lenzer, Craig Buerstatte, Eric Smith and Andria Fisanich with EDA's Office of Innovation and Entrepreneurship presented. Contact SSTI for information on how to access recordings of these webinars. SSTI hosted a webinar to discuss the recompetition of Hollings Manufacturing Extension Partnership (MEP) centers in 12 states and Puerto Rico. During the webinar, National Institute of Standards and Technology (NIST) staff will provide an overview of the funding announcement - due April 25 - and answer questions. An additional 11 states are scheduled for recompetition in July. From student debt to manufacturing employment; from budget crises to emerging programs, this webinar reviewed the major trends of 2015 and looked ahead to 2016. The presentation touched upon a wide range of issues that affect the potential actions and impacts of the technology-based economic development community. Evaluating the economic impacts of any innovation initiative is challenging: even more so when the effort involves research spending. So, it’s exciting to see progress toward developing more useful metrics on the economic and social effects of R&D. The November 2015 Inspiring Thoughts webinar covered new data being analyzed at the Institute for Research on Innovation and Science (IRIS) at the University of Michigan. This data provides evidence for links between university research and regional economies. Approximately 29 percent of startups fail due a lack of capital, according to a 2014 study from CB Insights. For many of these startups, the lack of capital kills the business within the first year due to the inability to attract second and third rounds of investment for working capital. Initial investors can play a vital role in addressing this capital deficiency by offering flexible terms that are appealing to other investors. In our first Webinar of 2015, SSTI will host a panel discussion on flexible models for financing startups that make the startups more appealing to future investors, increase their potential for growth, and can even provide a quicker return-on-investment for the organizations that support them. SSTI hosted with the Economic Development Administration two informational webinars regarding the recently released a solicitation for Regional Innovation Grants via the 2014 Regional Innovation Strategies (RIS) program. Under the RIS program, Commerce is soliciting applications for three separate Regional Innovation Strategy funding awards, including: i6 Challenge grants; Science and Research Park Development Grants; and, Cluster Grants to support the development of seed capital funds. These awards are intended to help develop regional innovation ecosystems that provide support and funding to startups engaged in the commercialization process that ultimately lead to high-growth companies – the drivers of regional economic prosperity and job creation. Building Legislative Champions: A "How To"
State legislative support for tech-based economic development activities increased in 2013—in part because of well-crafted strategies to secure that support. While state budgets have improved, resources are still limited and competition for them is fierce. Our experienced panelists will provide you with the "how to" needed to set the stage for success. The webinar highlights for lessons learned, gain inspiration and fine tune your state advocacy efforts through this engaging one-hour online event. You can make elected leaders among the strongest supporters for the good work your organization does to improve the local economy. Published more than 10 years ago, Innovation U: New University Roles in a Knowledge Economy described 12 universities impacting their regional economy. The sequel to Innovation U, Innovation U 2.0 Reinventing University Roles in a Knowledge Economy (Innovation U 2.0), includes another selection of 12 case studies of innovation-producing universities in the United States — what they do and how they came to be. The universities are exemplars not only in facilitating innovation, but also for the resulting economic impact. The universities are: Arizona State, Brigham Young, Cal Tech, Carnegie Mellon, Clemson, Florida, Georgia Tech, MIT, NC State, Purdue, Stanford, and Utah. Co-authors Louis Tornatzky and Elaine Rideout expand on their views of the "Innovation University" landscape and share personal insights about the project results. Louis Tornatzky, co-author, Innovation U 2.0. and (retired) department chair, professor, and co-director of the Center for Innovation & Entrepreneurship at California Polytechnic State University, San Luis Obispo. Elaine Rideout, co-author, Innovation U 2.0. and Kauffman Entrepreneurship Fellow, CEO/founder of WISER Systems, Inc., founder of four startups, and adjunct professor at North Carolina State University. As we plan for 2014, Dan Berglund, SSTI president & CEO, will provide us with an in-depth view of the latest trends affecting tech-based economic development (TBED), new developments in the field, opportunities for the year ahead, and the implications and issues for TBED policymakers and practitioners. This webinar will be a good opportunity to reflect on 2013 and look forward to 2014. Creating thriving, sustainable high-tech clusters requires a catalyst: some element that helps convert disparate businesses, researchers and investors into a robust community. This webinar examines how two leading tech-based economic development organizations are helping build more cohesive and vibrant innovation communities by making physical space available as a hub for entrepreneurial activity. These spaces represent low-cost ways that organizations can build an entrepreneurial culture, make valuable connections and establish their position as a leader in the regional tech economy. Major research universities are an invaluable asset in building thriving high-tech regions, but institutions of all sizes can play a key role in local innovation economies. The webinar features two successful regional networks connecting smaller colleges and universities to maximize their contribution to the high-tech economy. These networks are promoting inter-institutional collaboration, while also providing entrepreneurs with easy access to research services and commercializable technologies. While others are waiting on the sideline for the Securities and Exchange Commission to release equity-based crowdfunding regulations, several states and regions already have tapped into the potential of the crowd to support potential high-growth startups. With access to crowdfunding, entrepreneurs are able to gain access to new streams of capital and gauge market demand. Our panelists discuss the results of these early experiments in crowdfunding, share some of the lessons they have learned and explores what states and regions can do right now to unleash the potential of this powerful new tool.